Arched, feathered, straight, bold… eyebrows come in a variety of shapes and sizes, but they’re arguably one of the most defined features on your face. It’s natural to want to alter them and make them stand out for you. A variety of options are available to help you update your look including plucking, waxing, extensions, pencils, powder, gel, and tattooing. The creative options are endless, but usually they’re either far too permanent or need to be updated frequently. Microblading, a semi-permanent solution, is a fantastic alternative to sculpting the perfect eyebrows. This natural approach is a great path to take for those who want to reconstruct their brows, define them, fill overly plucked spots, fill gaps, or even add arches to flat brows. Microblading is a highly meticulous process that takes time with your brow artist, so be ready to dedicate several hours to the procedure. Your artist will examine your brows as they currently are, and they will talk through how you want your brows to look and what you want to accomplish with the procedure. During this time, your brow artist will give you their professional advice on what brow shape looks best for your facial components. Then, he or she will take the time to draw on brows using a removable pencil so you can see what the final product would look like. Your brow artist will ensure that this step is done properly and will likely double check that you’re entirely happy with the design before continuing with the rest of the process. You don’t want to get your perfect brows wrong! 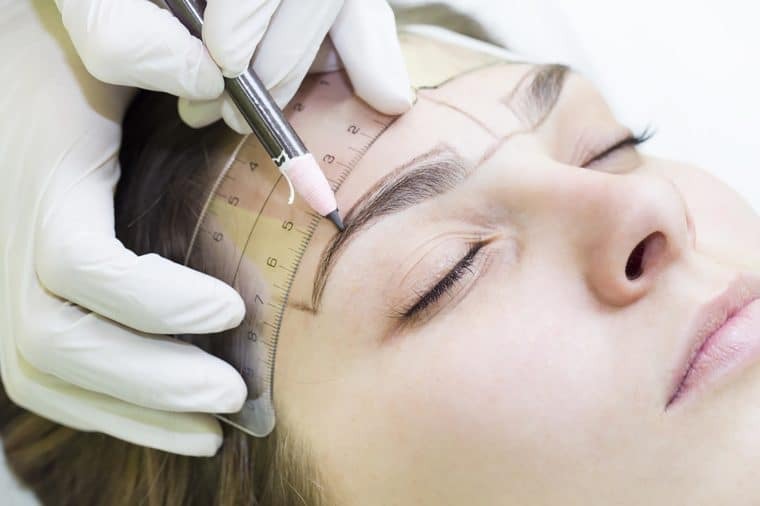 Before beginning the procedure, a numbing cream will be applied to your brows to minimize any pain or discomfort you may feel during the process. While it’s typically described as a minimally painful experience, brow artists state that some clients feel a slight discomfort overall. From here, your artist will begin the actual microblading process. Using a specialized pen, your brow artist will draw on each individual stroke to fill in or change your brows based on the design the two of you decided on together. The length of time this process takes is dependent on what design was selected, but once you’re done… well, you’re done! Microblading is incredibly low maintenance, and you won’t have to wait an extended healing time to see the final product like you would with tattooing. You’ll be immediately selfie ready. Because a blade is used on your skin, it can take up to thirty days for the healing process to be complete. Your brow artist will recommend coming in for a touch-up once the healing process is over, but beyond that you won’t have to spend hours upon hours taking care of your brows. Once a year, you’ll have to visit your brow artist for a touch-up, but that’s it. Microblading is all the craze lately, and it’s not hard to see why. The process is pricey, but it’s worth it. You’ll have the perfect brows, and you won’t have to spend every day taking care of them. Just wake up and run! Copyright © 2019 Vanity and Mascara. All rights reserved. Website by Terminus Agency.